Anti-India nationalists and militant networks in Pakistan, already dangerously potent, have seized on the issue as a new source of rage to perpetuate 60 years of antagonism. Jamaat-u-Dawa, the charity wing of Lashkar-e-Taiba, the militant group behind the Mumbai attacks, has retooled its public relations effort around the water dispute, where it was once focused almost entirely on land claims to Kashmir. Hafiz Saeed, Jamaat’s leader, now uses the dispute in his Friday sermons to whip up fresh hatreds. Water challenges are likely to continue to shape Indo-Pakistan relations in the future. Both states are projected to experience increased water shortages as population and economic growth climb, and the impacts of climate change take hold across the region. In particular to the Himalayan glaciers that provide many of the headwaters that flow through the Indus basin, current observations suggest that climate change could significantly affect those water resources as glacial retreat becomes an increasing feature of the geographic landscape, shrinking the amount of ice and reducing the seasonal runoff of water through Kashmir and the rest of the region. As water challenges continue to unfold in South Asia, it would behoove national security policymakers broadly to better understand how natural resources are likely to continue to shape the geo-strategic environment. Add to that a need for policymakers to understand the challenges of climate change, specifically how climate change could affect the region and on what kind of timescale. Incorporating these trends into their strategic processes should allow policymakers to better plan for the future. To learn more about how natural resources affect a broad range of U.S. national security interests, read our latest report: Sustaining Security: How Natural Resources Influence National Security. 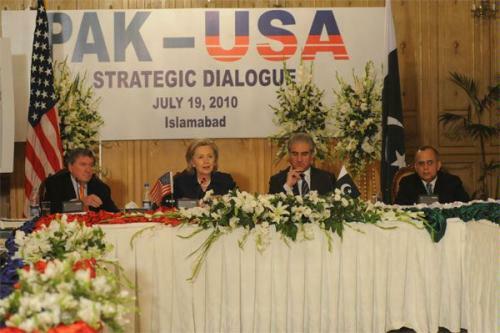 Photo: Secretary of State Clinton and Pakistan Foreign Minister Shah Mehmood Qureshi co-chair the U.S.-Pakistan Strategic Dialogue at the Pakistan Foreign Office in Islamabad. Courtesy of the Department of State.